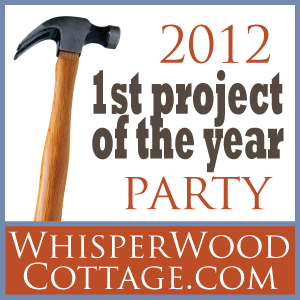 This project has been in the works or should I say in my head for a very long time. Have you ever thought of something in the middle of the night that made such good sense that you had to make it a reality. Well this is one of those cases. My husbands closet has needed a makeover for some time, and I finally started on it after the first of this year. Our closets are in the bathroom, he has his own and I have my own. I love having our own closets but his was becoming a catch all for all things that did not need to be in the closet. 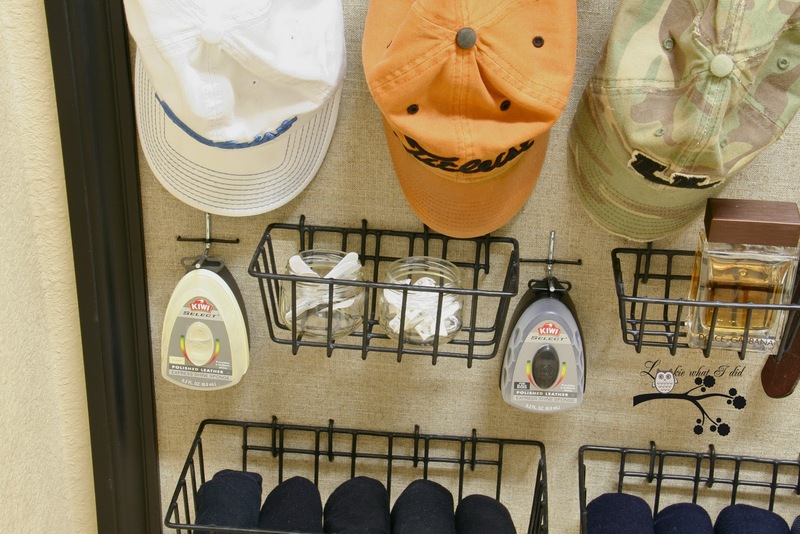 I created this system to help him get ready in the morning and have everything at his fingertips instead of walking around looking for things that were just all over the place. Let me show you how I got started. 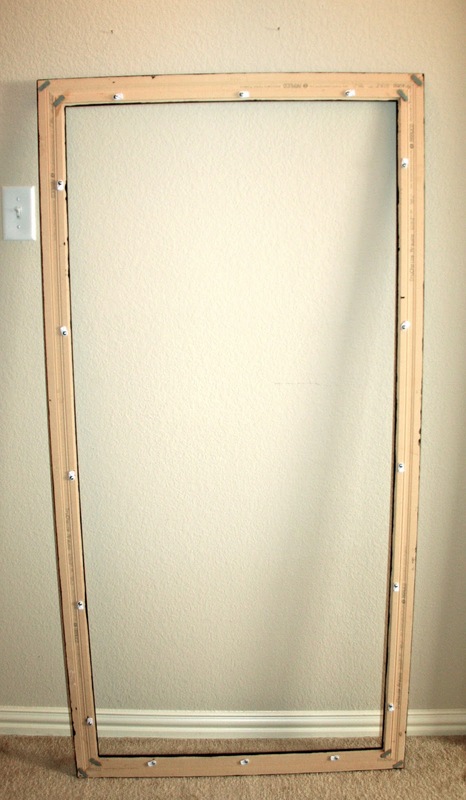 My Dad and I went to Lowe's over the Christmas holidays and purchased two strips of MDF crown molding for $3.50 each. Cheap huh! 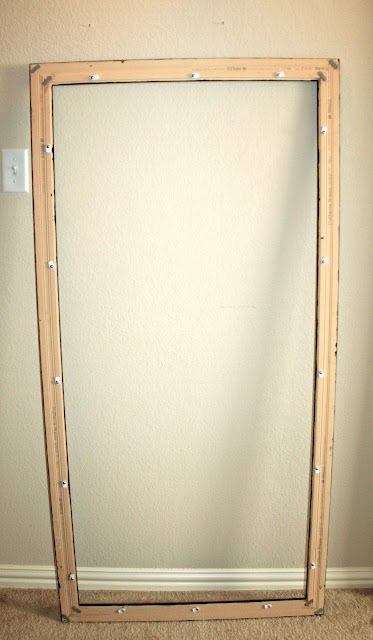 My Dad built the frame using the measurements of the wall in the closet. 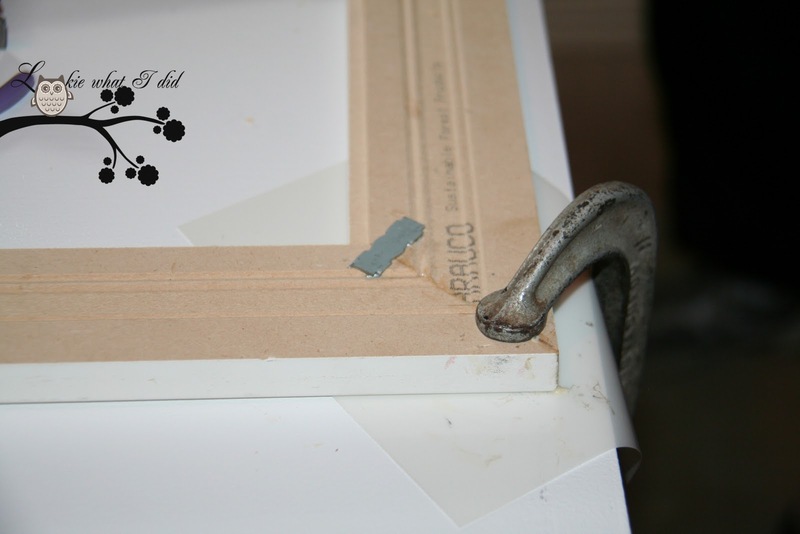 The inside of each moulding strip was routed with a 1/4" rabbeting bit. 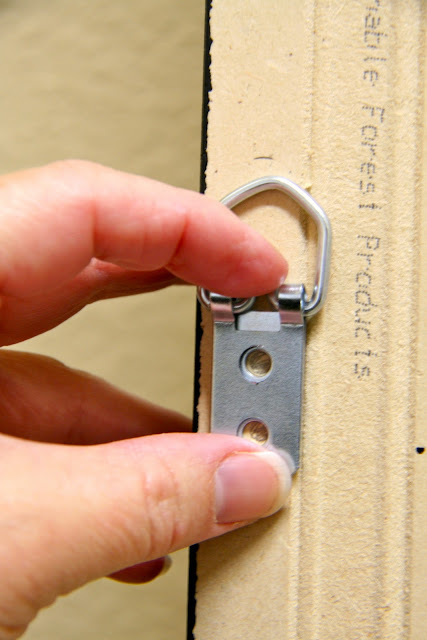 This is necessary to ensure that that the peg board sets inside the frame. 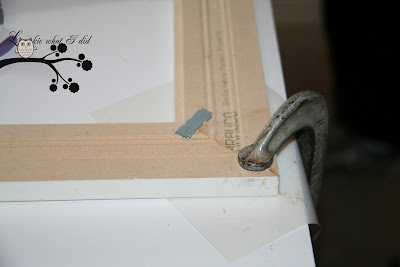 This is where I started taking pictures...so sorry...But here you can see how he glued and nailed the corners together...this frame was less than $7.00 to build...you can't beat that..
After the frame was painted Dad screwed the screen clips onto the back of the frame. The screen clips are for holding the peg board into place once it is installed. 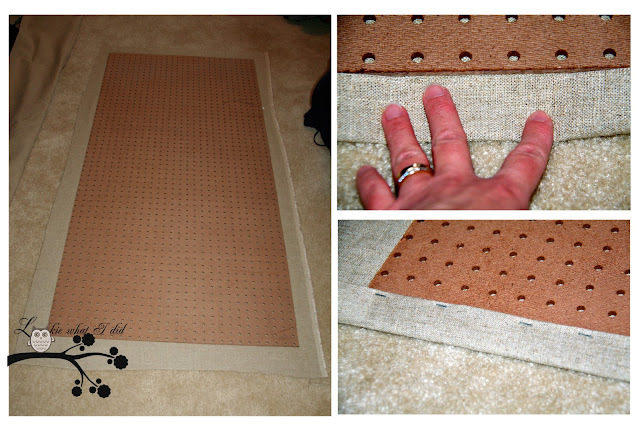 The peg board was the next item to purchase. 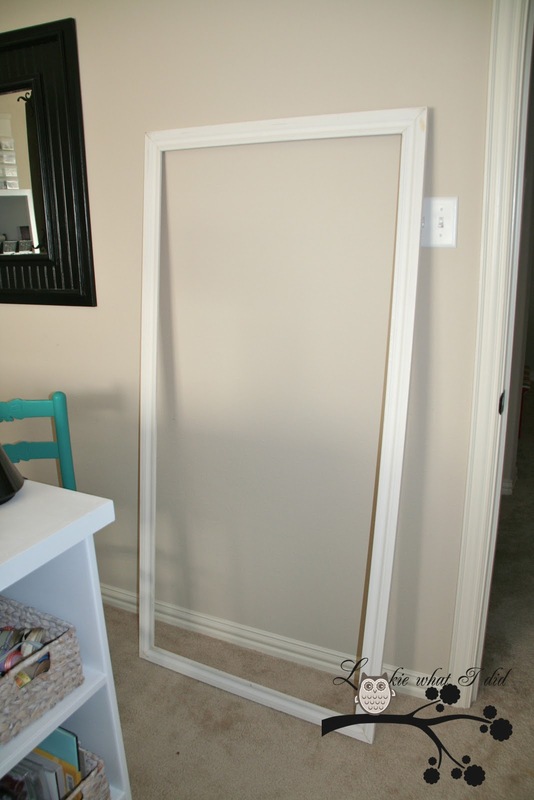 We needed to know the exact measurements because Lowe's will cut it for you...$9.00 for the whole sheet. 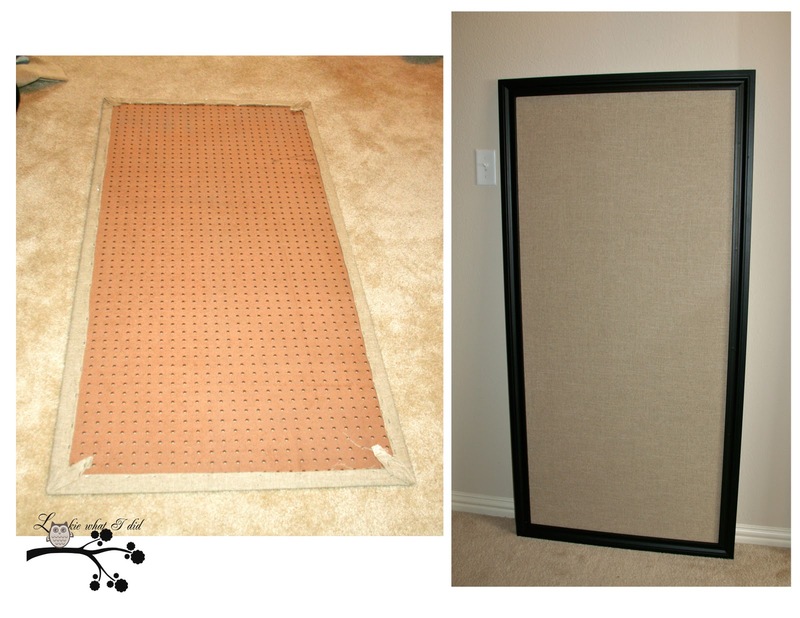 I had a ton of peg board leftover and will be using it for my closet. 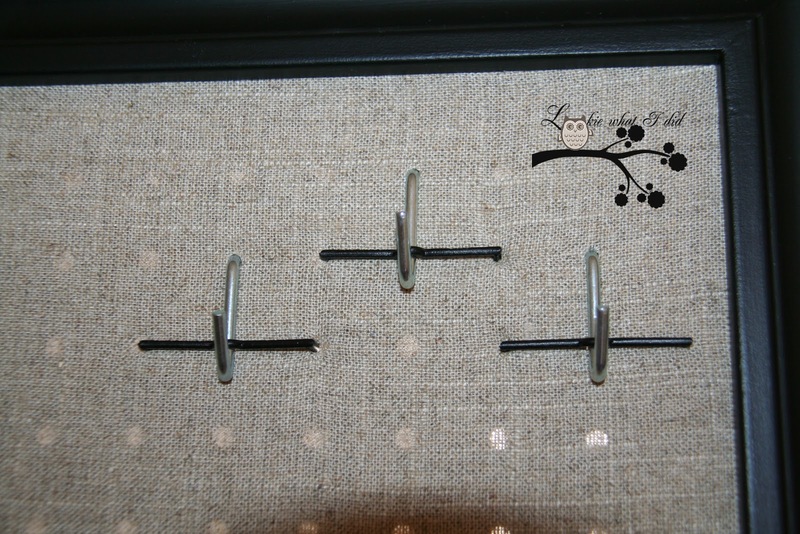 These hooks come with the locking black strip. 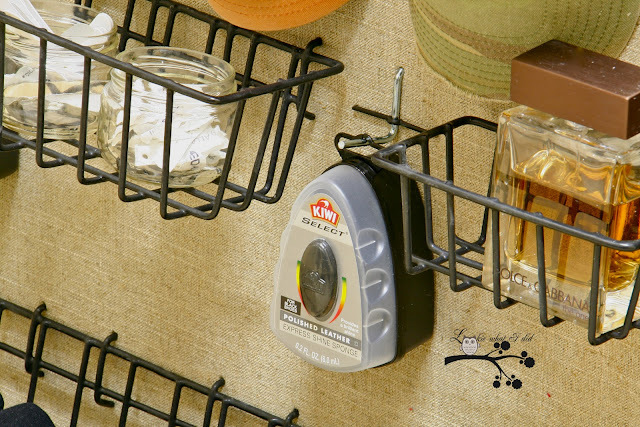 The strips keep the hook in place at all times. 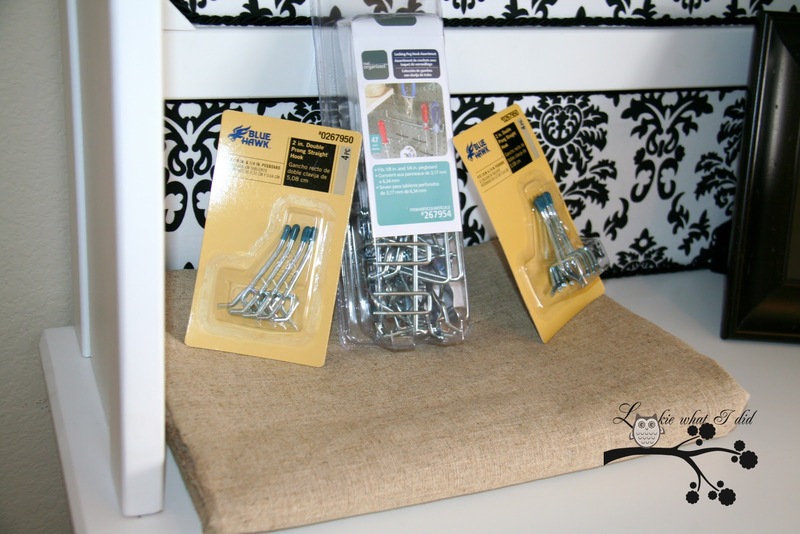 I used the heavy weight picture hangers and placed them a 1/4 of the way down on each side. Marked my hole and then used a tiny drill to get my hole started and then screwed them in place. Do the same for both sides. and here it is all finished and ready to hang...I was lucky that I had a studs on my wall to hang it! 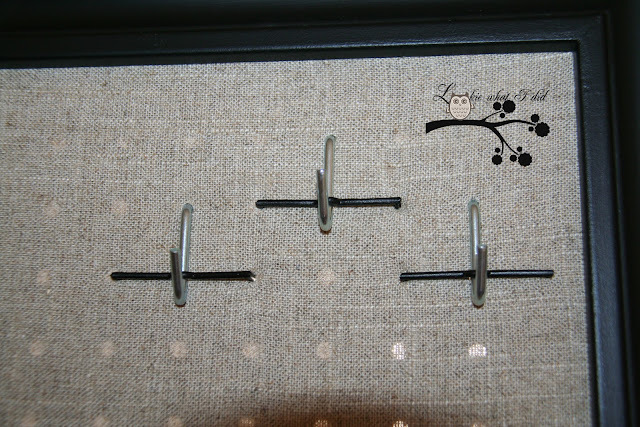 When I finished installing the hooks at the top and installing the hardware on the back of the frame, I went ahead and hung my husbands ties and belts so I would know how much space I had to work with toward the bottom. 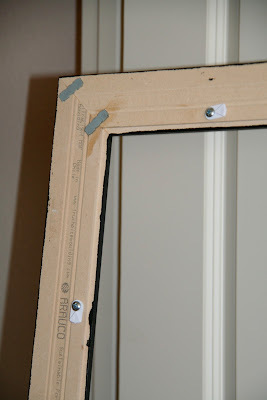 The pictures below show you the rest of the frame finished. I used the same method to install the baskets as I did the hooks. I'm so happy with the way this turned out. This system will so helpful for him when he is getting ready for work in the mornings. Everything is literally at his fingertips!! I have BIG plans for the one in my closet, so stay tuned...a little hint, pink and black!! 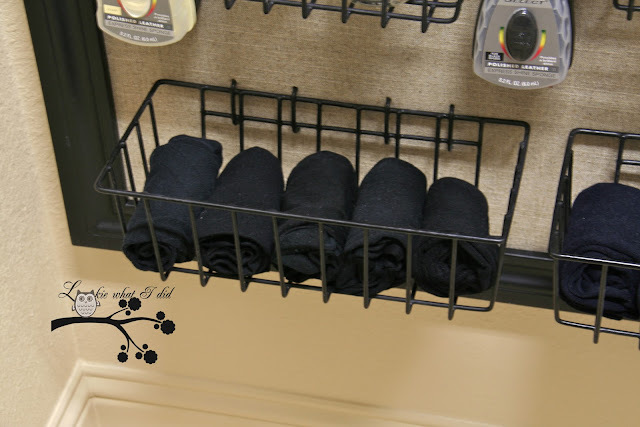 UPDATE...Below is a picture and link to the Closet Organizer for Her that I made soon after completing my husbands..
Click HERE to go directly to the post. Thanks for stopping by....have a great weekend!! This is great. My husband is very particular about his closet so when we finally finish renovating the master bedroom he will be getting one of these. What a great idea! My husband needs one!! Wow!!! I am so bookmarking this! My poor husband has all of his ties and "accessories" stuffed in the back of the closet right now. Great idea and wonderful tutorial! I found you at TT&J's link party! This is brilliant, I'm sooo impressed!!! Wow! Such a great idea! Everything is so organized! I love it! You did such a great job! Thank you for sharing! Wow that is soooo awesome!!! That sure beats, "hunny, wake up...do you know where my blue striped tie is?" Are you going to be adding a Feedblitz email subscriber thing? 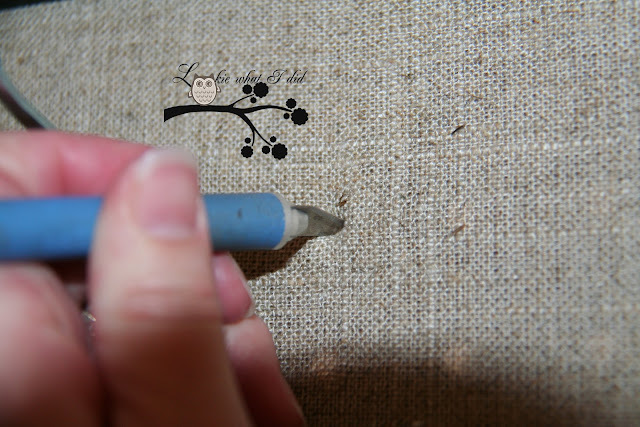 I would love to see you in my email =) Thanks for sharing a great idea!!!! OMG! I love it! 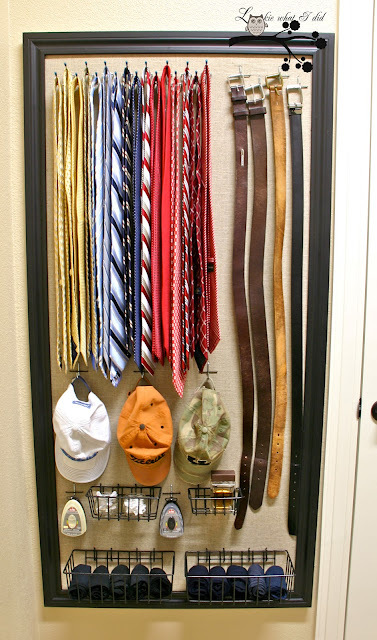 My hubs need this in our closet. You have inspired me to get onto this project right away. oh my gosh, that's fabulous! i'm sure he loves it (what's not to love!) the black and blue sock separating is key-my boyfriend gets ready in the morning while i'm still sleeping, so he goes back and forth to the other room with the light on to see the color of things! i'm sure he'd like this better. I love that it came out so gorgeous I love the look of it. You need to make these & sell them! Would sell like hot cakes! Great idea. Love. This is great! I've featured it at Grits and Giggles. Come grab a featured button! love it! You're so talented! 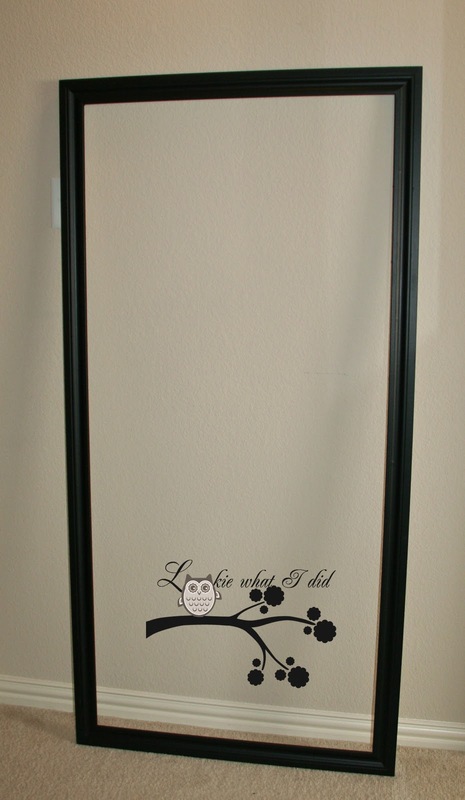 I'm actually working on two picture frame projects. So many ideas and not enough time. Hi! I pinned this on Pinterest, posted on fb, and featured at Creative DIYers Club. Please feel free to grab the feature button. Thanks for joining the party! Hope to see you again, this Thursday. Congrats on your feature! I love this project. It made my heart go pitter-patter with all the color coordinating! 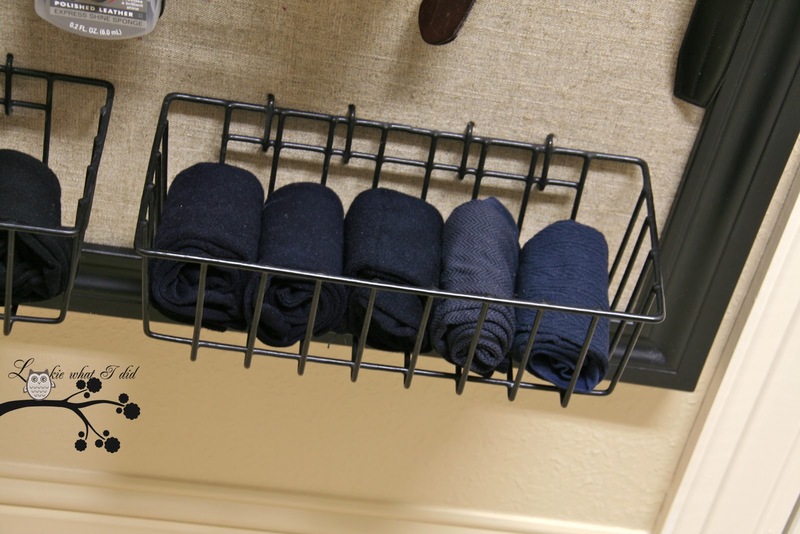 I got a kick out of the black sock basket and the blue sock basket-are all men color blind-everymorning I get asked "Is this black or blue?" 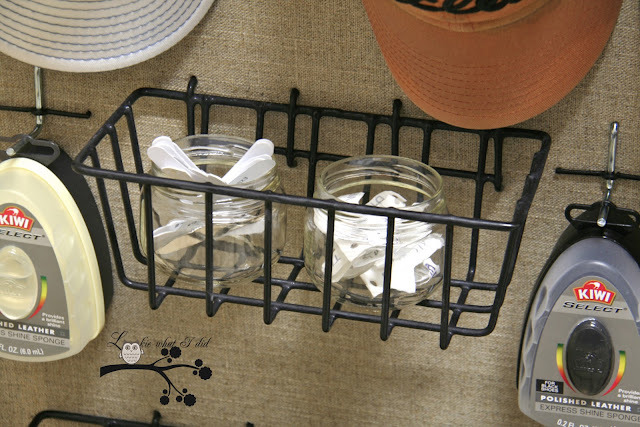 My hubby is super organized, so I don't need this for him. 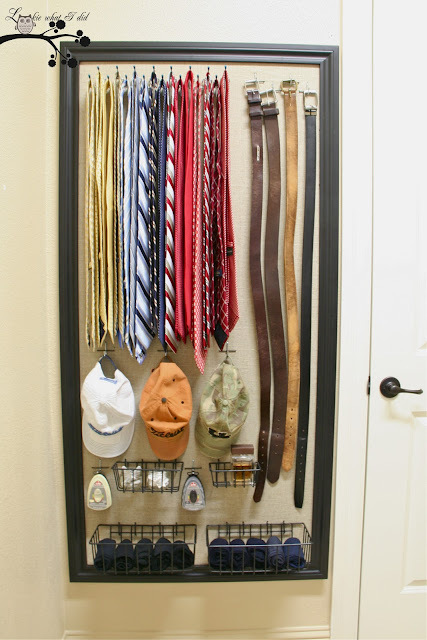 BUT, this will be PERFECT for my boys...their ties and hats are everywhere and they can never find their belts. I love this! Your frame is beautiful! I do have one question though. 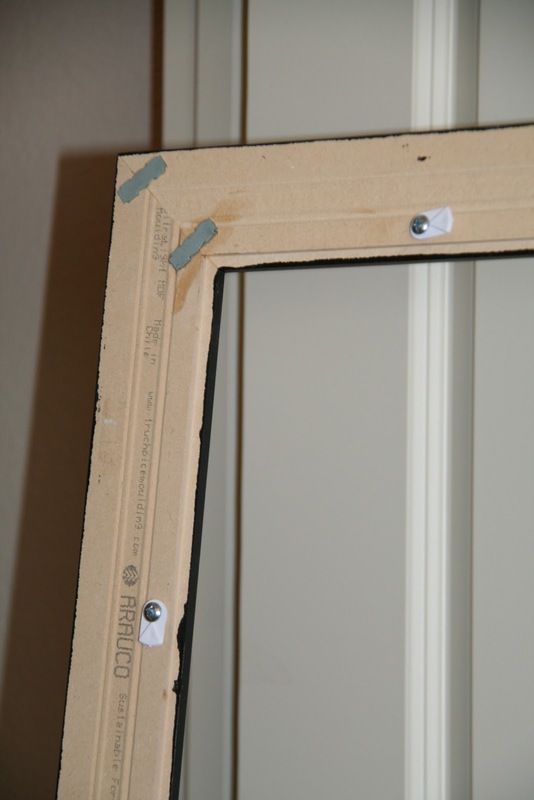 What did you use to join the corners of the frame together and where can I find them? The metal rectangular thingy? Love this! 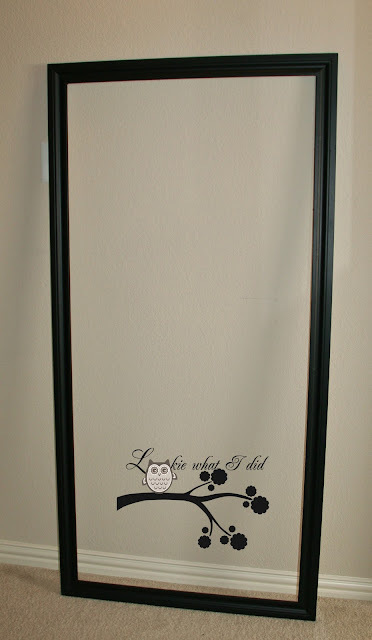 I found it linked on Pinterest- Could you post a picture of where you have it hanging in your bedroom/home? I would love to see how it looks in the overall space. Beautiful! Thanks so much for the inspiration, this is exactly what I have been looking for. Thank you for sharing this. This is just incredible. Well I guess my wife will be so glad if I made one or more closets Bergen for her. She really has lots of stuffs and is very particular about her close but I guess she will really love this project. Thank you for the idea and for the steps. I just became a follower. Great idea and nicely done! I'm curious too as to where EXACTLY did you hang this? IN the closet or on an outside wall of closet or wall in bathroom possibly? Very nice and helpful information has been given in this post. I like the way you explain the things. Keep posting. Thanks! Can you design one for women? This is fantastic! 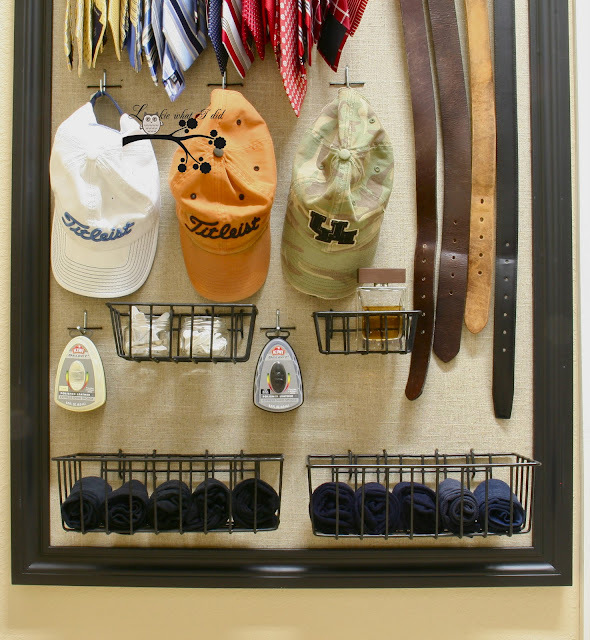 I freakin' love this..exactly what my hubby needs and I think I will try & make it for his birthday next month. AWESOME...thanks so much for sharing! could you tell me the dimensions you used for this? this is amazing! ... great job! Would you consider making and selling these? I am not handy at all and find this to be the perfect solution. There is nothing like this out there! 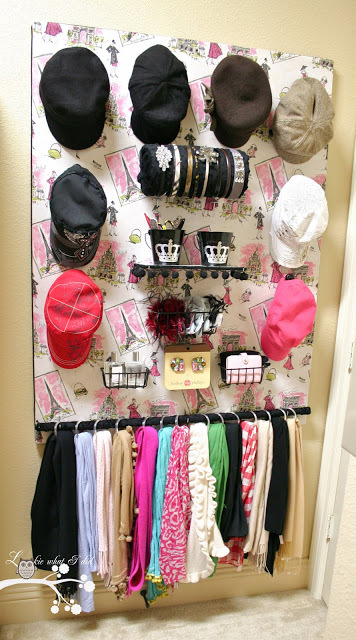 There are many ways to go about organizing your closet. 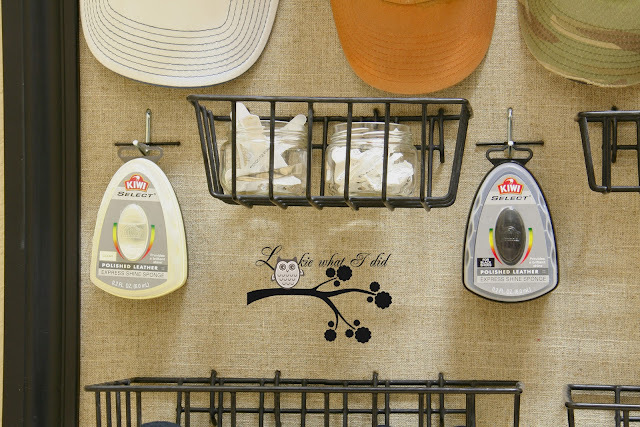 Different methods make more sense depending on your space and what you’re storing. No matter which method you choose, these closet storage solutions definitely helps you to reduce the space usage. Once again great post man! Cheers! A Perfect Closet & Cabinets offers a full line of cabinetry and built-in furniture ... Sanford, Orlando, Mt. Dora, Clermont, The Villages and surrounding areas closet organization systems Orlando. If you are in search of one of the leading companies specialized in providing high quality cabinet Pulls Knobs and Pulls at good prices, look no further than Hardware4Me.